It's curious that Kenny Chesney chose to call his 11th studio album "Just Who I Am: Poets and Pirates," as he opted to employ only outside songwriters. The country superstar is a solid tunesmith who has made some of the best contributions to his previous releases. But he has cherry-picked wisely for his new CD, out today, finding different components of himself in the words and music of others. 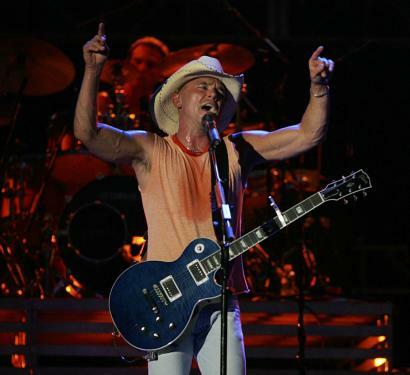 The prevailing Chesney persona - "fun Kenny," the tipsy, shirtless, shoeless, rum-gulping island party host - appears in the ode to the morning-after haze "Got a Little Crazy" and a cover of Dwight Yoakam's greasy honky-tonker "Wild Ride." With its near-comical arena-rock talk-box flourish, Joe Walsh on guitar, and bump-and-grind groove, it's destined to be a pole-dancing classic. "Introspective Kenny" serves up both the stripper's lament "Dancin' for the Groceries" and "Wife and Kids," in which he contemplates the crimp that the road and the radio put into the pursuit of family life. "Nostalgic Kenny" appears in the easy acoustic amble of "Never Wanted Nothing More," appropriately the debut single as it recalls personal firsts. While this is far from Chesney's initial foray into retracing paths and conjuring the lingering imprint of youthful kisses and escapades, it's one of the strongest. George Strait shows up to lend a hand to "blue-collar Kenny," sympathizing with the frustrations of clock-punchers in "Shiftwork," an incongruously jaunty little shuffle about drudgery. Finally, and most satisfying, is "mature Kenny," who sings "Demons," a solemn set closer about the ways in which we, often helplessly, choose to do battle with ourselves, and who recognizes his own romantic shortcomings on "Better as a Memory." What all of the Kennys have in common - whether in songs that veer toward heartland rock or adult contemporary pop - is a love of close harmony that elevates the proceedings and a near-relentless adherence to midtempo rhythms that sometimes deflates them. Still, though neither pirates nor poets appear explicitly, Chesney's rakish spirit and affection for words come through, even within the well-manicured confines of contemporary country. Commercially speaking, it has been amusing watching rappers Kanye West and 50 Cent implicitly count Chesney out in today's battle for Billboard supremacy, as he has proved formidable competition in the past. But whichever artist claims No. 1 this week is irrelevant. The sincere, average-Joe appeal of "Just Who I Am" - the whole to which Chesney's various personas add up - will likely resonate with fans in the back row of the stadiums he favors, long after all of the records slide down the charts. Sarah Rodman can be reached at srodman@globe.com. For more on music go to boston.com/ae/ music/blog.